In this practice test you will be required to answer all 4 Motorcycles sample questions from Your Keys to Driving in Queensland. 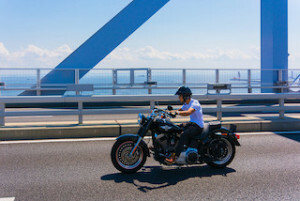 What type of motorcycle can be ridden under a class RE licence? A motorcycle with an engine capacity of more than 660mL. A motorcycle with a power to weight ratio of more than 150kW per tonne. no more than four riders side-by-side in one marked lane. Is a pillion passenger required to wear a motorcycle helmet? Only if the motorcycle has an engine capacity of more than 250mL. No, only the person controlling the motorcycle is required to wear a helmet.